Ballads of Sacco and Vanzetti è una raccolta di ballate folk scritte e interpretate dal cantautore americano Woody Guthrie, ispirate alla vicenda di Sacco e Vanzetti. Le ballate furono commissionate da Moses Asch nel 1945, e registrate tra il 1946 e il 1947. Guthrie non completò mai il progetto, e si ritenne insoddisfatto dal lavoro, sebbene suo figlio Arlo Guthrie, a sua volta cantautore professionista, giudicò le ballate del ciclo "Sacco e Vanzetti", tra le migliori mai composte da suo padre. Una canzone inedita, "Sacco's Letter To His Son", fu registrata da Pete Seeger per il progetto. 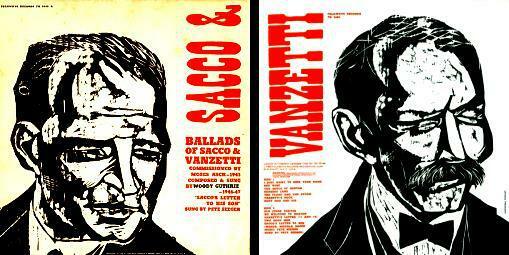 Ballads of Sacco & Vanzetti is a set of ballad songs, written and performed by Woody Guthrie, related to the trial, conviction and execution of Sacco and Vanzetti. The series was commissioned by Moe Asch in 1945 and recorded in 1946 and 1947. Guthrie never completed the project and was unsatisfied by the result. The project was released later in its abandoned form by Asch. An unreleased track, "Sacco's Letter To His Son" was recorded by Pete Seeger for the project. "Born in Poland in 1905, Asch arrived in the United States when he was ten years old. He spent a few years in German in the early 1920s, studying electronics, but by the time he found himself back in New York, in 1926, his interest in American folk music had been stirred by his discovery, in a bookstall on a Paris quay, of John Lomax's book Cowboy Songs and Other Frontier Ballads. "While building radio equipment and arranging sound systems for clients ranging from Yiddish theaters to burlesque houses on the Lower East Side, Asch came up with the idea of creating a record label to document the music that the larger commercial labels tended to leave alone. "His idea was nourished not only by a love for the music itself but also by a brand of leftist populism in which folk expression was a voice for the disenfranchised. By taste and political conviction, Asch was attracted to the raw and the otherwise unheard. "In the early 1940s he started two record companies, Asch and Disc. Both failed. Before folding them Asch recorded his most important artists -- the singer and songwriter Woody Guthrie and great twelve-string guitarist and singer Leadbelly. "In 1947 Asch started Folkways, and this time it worked. 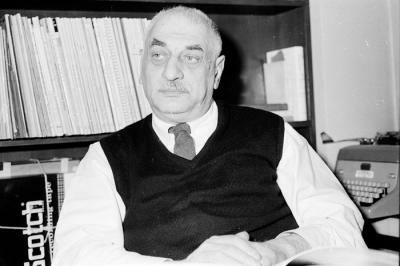 Until his death, in 1986, Asch was Folkways' president, chief financial officer, talent scout, audio engineer, and sometimes shipping clerk." "In 1987, the Smithsonian bought out Folkways, agreeing to keep all 2,200 Folkways albums in print. By writing or calling Smithsonian/Folkways (414 Hungerford Drive, Suite 444, Rockville, MD 20850; 301-443-2314 or fax 301-443-1819) one can order any Folkways title and receive a high-quality cassette, along with the original descriptive notes, for about $11. A free copy of the The Whole Folkways Catalogue, which lists every title, should be ordered first. "It is," concludes Piazza in The Atlantic Monthly, "the definitive guide to Asch's bold, eccentric, priceless legacy." It was an indirect impact on Dylan, but very major. Gotta get to Boston, root hog and die. So I've got to get to Boston, root hog and die. Ships on the oceans, planes in the skies. But I've got to get to Boston, for two men'll die. But I've got to get to Boston, 'fore sundown tonight. Walkin' down this road shoulder, tears in my eyes. But Judge Webster Thayer says they must die. Some come to Boston to drink and to fight. So Judge Webster Thayer says they must die. That's a nice-pacin' team that you got here all right. Did you ever hear such a thing in your life? Judge Webster Thayer killin' two men tonight. Throw in your coal an' steam up your steam. Got to get to Boston 'fore sundown tonight. Due parole del traduttore.Il modo di dire root hog or die (alla lettera: “grufola maiale, o muori”) significa “combatti o muori”; qui si noti che si dice and die, quasi non ci fosse alternativa alla lotta. Il testo della canzone presente in rete è sbagliato in alcuni punti, per il consueto procedimento della copia automatica e acritica di testi imprecisi; e così è rimasto a lungo anche in questo sito. All'ascolto sono stati effettuati gli opportuni aggiustamenti. devo andare a Boston, lotta e muori. e io devo andare a Boston, lotta e muori. ci sono navi sugli oceani e aeroplani nei cieli. ma io devo andare a Boston, perché due uomini moriranno. ma io devo andare a Boston prima di buio, stasera. camminare a bordostrada con le lacrime agli occhi. ma il giudice Webster Thayer dice che devono morire. qualcuno va a Boston per bere e fare a cazzotti. e così il giudice Webster Thayer dice che devono morire. hai proprio una bella squadra che fa andare il treno a puntino. La hai mai sentita una cosa del genere nella tua vita? Il giudice Webster Thayer ammazza due uomini stasera. butta dentro il carbone e fai fumare il vapore. ma io devo andare a Boston stasera prima di buio.